COLUMBIA, Mo 2/15/12 (Feature) -- Montgomery, Alabama attorney Fred Gray, Sr. has long championed civil rights. When authorities arrested Rosa Parks for refusing to give up her seat on a Montgomery city bus to a white person, Gray was her defender. When 26-year-old Martin Luther King, Jr. led a boycott of those same buses and faced legal action, 25-year-old Gray was the lawyer at his side. For 623 men -- unwitting experimental subjects for forty years -- Fred Gray won more than $9 million when he settled claims surrounding the U.S. government's infamous "Tuskegee syphilis experiment." But Gray has also long championed an African-American icon of a different sort -- a man who almost single-handedly brought black history to museums, schools, and public institutions around the nation -- sculptor Isaac Scott Hathaway. Hathaway left a valuable, significant, and previously undiscovered part of his artistic vision at Douglass High School in Columbia, Missouri: a bust of the hero who first inspired him, abolitionist and newspaper editor Frederick Douglass. "The bust at Douglass High School is one of those rare finds that sets a community apart," said VSA Arts Missouri executive director Lisa Kemper in Columbia. When, as a 2005 school board candidate, I visited Douglass High School in Columbia, principal Brian Gaub greeted me with an intrigue. The school, he said, had one of the nation's oldest pieces of African-American art. We toured the building. Gaub explained how the school -- in a predominately African-Amer Gaub, Phyllis Chase, Beulah Ralph, Douglass Bustican neighborhood -- had been segregated, until Brown v. the Board of Education put black and white education on the same footing in 1954. In the hallway, I saw the art to which Gaub referred -- a nearly 3-foot tall, exquisitely detailedbronzed plaster bust of Frederick Douglass in a glass case. It had been in the building for "as long as anyone could remember," Gaub said, but only in the case for "about the last 12 years." I asked if he knew anything about the bust's creator. "Not really," he said. "I wonder if we can find a signature," I said. Mr. Gaub and I moved the glass case slightly away from the wall and I saw this inscription: Isaac Hathaway; the date 1918; and a circled letter "c" -- the international copyright symbol. International law has long dictated that, "all sculptors should copyright their work by affixing to the sculpture the international copyright symbol, their name, and the year of the cast." Frederick Douglass High school was built in 1916; Hathaway was teaching in nearby Arkansas at the time; and the marks looked authentic. I knew from the Antiques Road Show that African-American art had surged in value and significance, so I did some research on Google, finding entries for Hathaway at the Long Island University Art Institute; Kentucky Historical Society; and many other locations. Gray -- who spoke in Lexington, Ky. at a "Celebration of the Life of Isaac Scott Hathaway" -- was Hathaway's student, friend, and later, his estate attorney. Lexington-born in 1874, Hathaway was a small man who "looked like an artist," Gray said. Sculpture became Hathaway's chosen calling when at age 9 he was touring a Cincinnati museum with his father. Hathaway left his father's side -- and returned crestfallen. "What's wrong? Where were you?" his father asked. "I was looking for a statue of Frederick Douglass," the boy said. "My teacher said only the truly great are perpetuated in stone and bronze, and Frederick Douglass was a great man." "That may be," his father said. "But we'll have to grow our own sculptors." On leaving the museum -- with its busts and statues of prominent white Americans -- Hathaway told his father, "I am going to model busts of eminent Negroes and put them where all people can see them." Hathaway pursued this singular vision the rest of his life. He studied ceramics and sculpture at Pittsburg Normal College in Pittsburg, Kansas; the Art Department of the New England Conservatory of Music; the Cincinnati Art Academy; and the College of Ceramics of the State University of New York. He taught elementary school in Kentucky, preparing plaster of Paris models for science lessons and later, intricate anatomical models for medical schools. From his first art studio -- a converted chicken coop -- Hathaway quietly broke racial barriers. Most of his commissions came from prominent white academic and political officials. Hathaway bustsIn 1904, William Marshall Bullitt -- US Attorney General under President William Howard Taft -- commissioned Hathaway to create the largest plaster crime scene model ever used in a court of law up to that time -- a job three other sculptors termed "impracticable." The model turned out so realistically that the judge had to repeatedly over-rule opposing counsel's loud objections. That same year, the State College of Kentucky hired Hathaway to recreate the Bath Furnace Meteorite, as it might have looked before its fiery plunge to Earth in Sharpsburg, Ky. The Smithsonian Institution later exhibited the model. For seven months in 1912, Hathaway was the sculptural designer for the Smithsonian Institute's National Museum, where Pathe -- the famed black-and-white movie newsreel company -- filmed him making a reproduction of the human fetal brain -- the first motion picture of a black professional at work. Hathaway's notoriety spread and he formed the Afro Art Company, later the Isaac Hathaway Art Company. 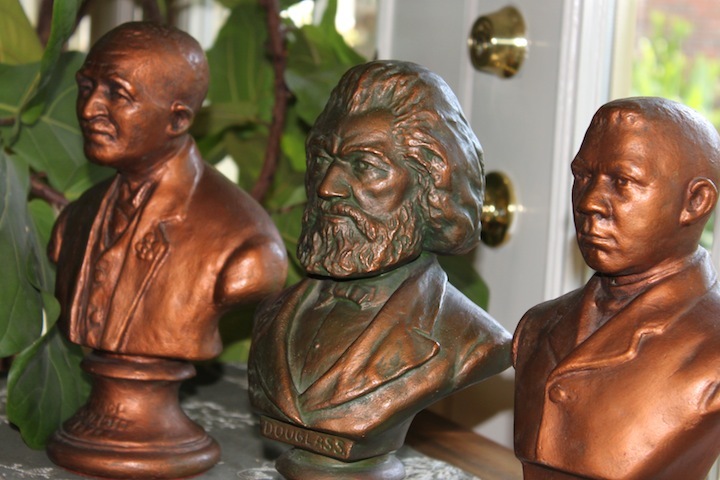 For schools and public places, he hand-produced limited edition busts of prominent African-Americans, including educator Booker T. Washington, scientist George Washington Carver, and Frederick Douglass. After he married, Hathaway returned to teaching. 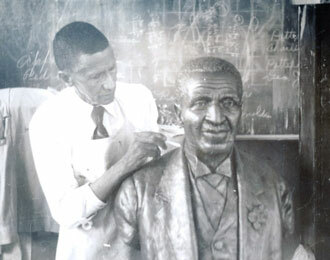 He founded the Departments of Ceramics at Alabama's Tuskegee Institute; Alabama A&M College; and Alabama State College. 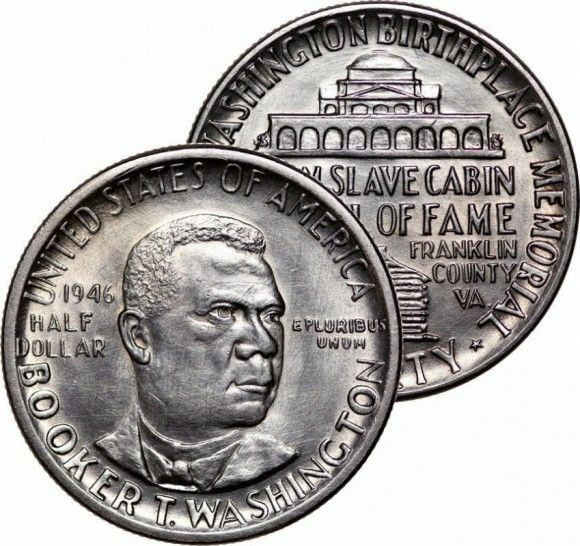 On August 7, 1946, President Harry S. Truman commissioned Hathaway to create a fifty-cent piece "to commemorate the life and perpetuate the ideas and teachings of Booker T. Washington." Another U.S. Mint commission followed with Hathaway's design of the George Washington Carver commemorative fifty-cent piece in 1951. Today, two prominent museums bear his name: the Isaac Hathaway Art Institute at the University of Arkansas, Pine Bluff; and the Isaac Scott Hathaway Museum in Lexington, Kentucky. Alongside his sculptures, those museums exhibit another Hathaway specialty -- facemasks, in life and death, of prominent African-Americans including NAACP founder W.E.B DuBois; poet Paul Laurence Dunbar; and educator Mary McLeod Bethune. "Sculpture records the deeds of nations and individuals," said Hathaway biographer Odelia Walker. "Isaac Hathaway understood this, and created for us a heroic record of distinguished African Americans. In the process, he left a legacy for and about all races." I sent local newspaper photos of the Douglass bust to several prominent art historians and curators, along with a brief history of the high school and information about the inscriptions. "I don't see why this wouldn't be an authentic piece, especially given what Mr. Hathaway's company was all about -- providing inexpensive sculptural portraits of famed black Americans to schools, etc.," said Pennsylvania State University (PSU) African-American art expert Joyce Henri Robinson. Art history professor Tritobia Hayes Benjamin compared the photos with an identical bust on display at the Howard University Art museum in Washington, D.C.
"Yes -- it's the same piece, in fact," said Benjamin, associate dean of the Howard University division of fine arts. "Mr. Hathaway made a few of these, but I don't know how many." How, I asked, could these curators be certain the piece was authentic without physically viewing it? "As far as I know, there wouldn't be a market for fake Hathaways, so that seems most unlikely," said Robinson, curator of the Palmer Museum of Art and associate professor of the PSU Department of Art History. "No, it's not a fake. Why would it be?" added Henri Linton, curator of the Isaac Scott Hathaway Museum of Fine Arts at the University of Arkansas, Pine Bluff. "It was probably commissioned by your institution. Isaac used to sell a small version of these busts door to door back before he made the larger versions." Linton followed his comments by sending me a full-color catalog of Hathaway's work. The identical Frederick Douglass bust is on the cover. "The piece should be insured for no less than $50,000 to $100,000.00 -- conservatively," Linton told me. "It should be kept in a very safe case, not easily jostled or knocked over." I informed Gaub and senior members of the Columbia Public School administration about the bust, and offered help in seeing it authenticated. I did not receive a response. "But we like it and we're going to keep it," Gaub later told me. "The art of a people," Hathaway said before his death in 1967, "not only conveys their mental, spiritual, and civic growth to posterity, but also can best portray their feelings, aspirations, and desires." By setting sculptures of black Americans alongside white Americans, Hathaway brought black and white history together. The Bill of Rights and civil rights, as he saw them, were two results of a single march to freedom that begin with Americans at home fighting a British king and continued with a man named King fighting to make America the home he knew it could be. But Hathaway did not view black history as merely a struggle for civil rights. His sculptures reflect a panorama of historical achievement in law, politics, theology, education, business, engineering, and science. Nor was he a fiery and eloquent orator like his hero Frederick Douglass. Rather, Isaac Hathaway "was a man of few words," Fred Gray later recalled. "He was a profound man who went about doing his work very quietly," sharing an artistic vision of black America and white America, flowing together through history on a single river of time. -- by Mike Martin. Originally published in the Columbia Missourian.